These trends are expected to continue. Most recently, the International Energy Agency (IEA) projected that LNG will be the fastest-growing source of natural gas supply, rising at an expected annual growth rates of 4 percent per year through 2035. 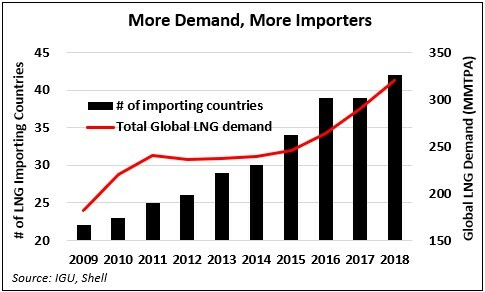 Meanwhile, at least 20 other countries around the world have announced plans to begin LNG imports at some point over the next decade, which would bring the total to more than 60 countries. It’s no coincidence. The uniquely beneficial attributes of natural gas as an energy source are driving LNG demand growth. Natural gas is well-suited for everything from residential heating and cooking to industrial operations and, of course, power generation. Even better, natural gas can meet these needs while outperforming many other competing fuel sources in an environmental sense (which will be the focus of the third part of this series). It’s this combination of flexibility and environmental performance that is at the core of booming growth in global natural gas demand. 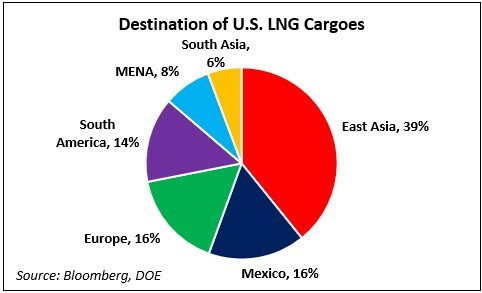 In this context, the United States is especially well-positioned to be a major LNG supplier for a number of reasons – as evidenced by the sheer diversity of U.S. LNG cargo destinations over the past three years. 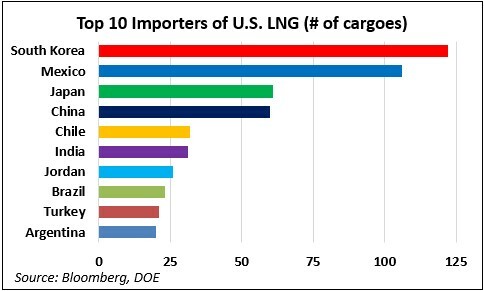 The U.S. now exports about 30 LNG cargoes per month, but the cargoes disperse widely once they leave port. To date, the four largest importers of U.S. LNG are South Korea, Mexico, Japan and China. Yet significant cargoes have also been directed to 11 countries throughout Europe, more than a handful in South America and even a few in the Middle East/North Africa. Moreover, the leading destinations for U.S. LNG have fluctuated over the past few years. When exports first began in 2016, South America emerged as the leading importer. Through 2017 and 2018, East Asia took over as the primary destination, fueled by tremendous demand growth in China. Most recently, this winter saw a record number of cargoes heading to Europe, the result of warmer-than-average weather in Asia (which kept peak demand in check) and rising shipping rates. The shifting destinations are in the end, driven by price. In contrast to highly-traded global commodities like crude oil, natural gas prices remain largely disconnected between continents. For much of the past decade – since the onset of the shale gas revolution in the United States – North America has consistently benefited from the lowest gas prices in the world. European prices have typically been roughly twice those of the U.S., while landed prices in Asia and South America have often been three times as high. 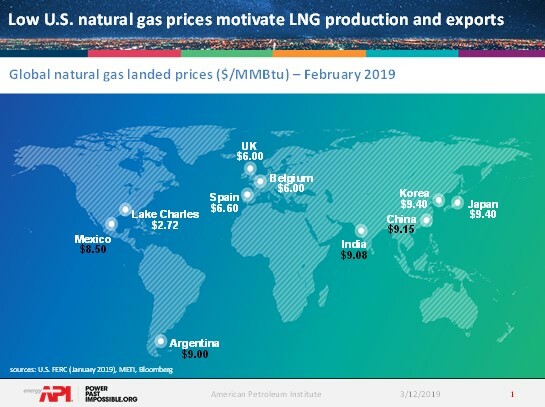 These significant price differences are what motivate LNG flows from low-cost production areas like the United States to markets around the world. Price signals alone don’t explain the diversity of U.S. LNG cargo destinations. Simple geography plays a role, with the U.S. being nicely positioned to supply markets in Europe, South America and (thanks to the expanded Panama Canal) high-growth importers in Asia. Perhaps even more critically, U.S. LNG offtake contracts (and the underlying federal authorizations) put few limitations on cargo destinations – a sharp departure from long-held industry norms, in which buyers were only allowed to direct cargoes to a few fixed destinations. Thus, U.S. LNG not only offers buyers access to some of the world’s lowest natural gas prices, it also provides unprecedented flexibility. Asian buyers are free to send cargoes to Europe, while European buyers routinely place cargoes in South America. This adds significant liquidity to the market – as evidenced by the growing number of short-term and spot transactions. It also gives buyers the confidence to make long-term investments in natural gas infrastructure in their own domestic markets and around the world. 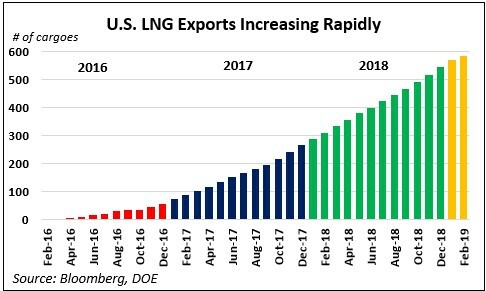 By all accounts, 2019 is set to be an incredible year for U.S. LNG. The U.S. Energy Information Administration projects LNG exports will average 5.1 billion cubic feet per day (Bcf/d) for the year, a 72 percent increase from an already impressive 3 Bcf/d in 2018. Growth will be driven by a number of major new projects ramping up or coming online in Texas, Louisiana, Georgia and Maryland. Indeed, by the end of the year, the United States is likely to be the world’s third-largest LNG exporter, behind only Australia and Qatar – a truly remarkable transformation for a country that until recently was projected to become a major LNG importer. Further, 2019 is likely to see multiple additional U.S. LNG export projects make serious commercial and regulatory progress. Already one major project – Golden Pass LNG – has announced a final investment decision, with another – Calcasieu Pass LNG – expected to do so soon. These projects alone represent nearly $15 billion in investment and when completed in the early 2020s almost certainly will push the United States into the top spot as the world’s largest LNG exporter. Just as was the case with the first wave of U.S. LNG export projects now currently coming online, these second-wave projects are underpinned by sharply rising global gas demand. In the next part of this series we’ll take a closer look at a handful of the key markets driving this tremendous global natural gas demand growth. Each importing country or regions features its own unique energy story, with different drivers of growth both now and in the future. Regardless, we’ll see that the growing availability of reliable and low-cost U.S. LNG provide importers around the world with an unprecedented amount of energy security and flexibility. These global benefits are among the very best aspects of the U.S. energy revolution. Dustin Meyer is a Policy Advisor at API, serving as a subject matter expert on Global Gas & LNG. His efforts are focused on establishing the United States as a leading supplier of reliable and affordable LNG for the rapidly expanding global gas market. Dustin has a Masters in Energy Policy & Economics from Yale University and a B.A. from Princeton University. He lives in Washington, D.C. with his wife Tess and dog Mabel.